Alpacas fall into two broad categories – Huacaya and Suri. 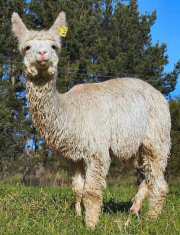 When most people think of alpacas, they visualise the Huacaya Alpaca, with a soft yet dense sheep-like fleece. When shorn the Suri Alpaca looks pretty much like the Huacaya Alpaca, but in full fleece the Suri has a very different look (see photo at left). 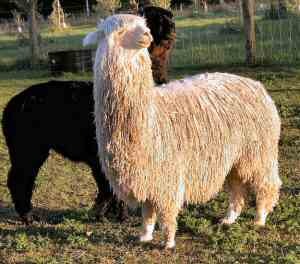 Unshorn, the Suri has a silky, lustrous fleece which cascades almost to the ground in shimmering locks. A fully fleeced suri walking across the paddock in the sunshine is truly an impressive sight! Suris are Alpacas that have developed a highly specialized fleece which produces one of the most sought-after natural fibres in the world. It is this fleece, with its greater lustre and silkiness, that sets Suris apart from the great majority of Alpacas farmed in New Zealand. Suris first arrived in this country in 1999 and are still rare, commanding high prices. They make up no more than 6% of the Alpaca population world wide. Most Suris are fawn or white but work is being carried out in establishing other colours using accepted breeding-up techniques. The reason that Suris are so rare – even though the long fleece is understood to be caused by a dominant gene – is that in Peru, Chile and Bolivia the mountain climate is harsh and the Suri fleece does not offer as much protection from the cold as the Huacaya fleece. In South America, the Suris survive only at lower altitudes. In New Zealand, however, the climate is much kinder and Suris generally do well here. Thanks to Cilla Taylor of Armentalis Alpacas for assistance with this page.